It's the easiest virtual million you'll ever make. Rockstar is getting into the Black Friday spirit with a $1.35 million in-game cash bonus for anyone who plays GTA Online for seven days this week. Perfect if you need a new ride or some fresh outfits for celebrating the holiday season in Los Santos. "Starting today you'll earn a $750K bonus just for jumping on, along with a subsequent $100K for each additional day through November 26th. 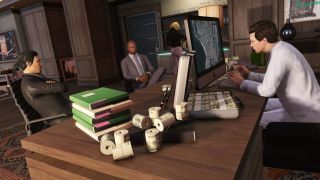 Play all seven days and get$1.35m," promises Rockstar in the game's latest update. There's also in-game discounts on a bunch of cars and aircraft. The Nagasaki Shotaro is 40% off and a garage's worth of super cars like the Overflod Entity XXR and Truffade Nero are all 35% off. If you prefer to travel by air, the V-65 Molotok, Buckingham Pyro, FH-1 Hunter and Mammoth Tula are all 60% off. There's also the usual extra perks for the Adversary Modes. "Hunt down your target in Search & Destroy or head to the airfield to take on a rival MC in a Joust deathmatch with Double GTA$ & RP in all Biker Work & Challenges. And if you're looking to push some product across Southern San Andreas grab double rewards on Biker Sell Missions for the same period," says Rockstar. "Plus all Bodyguards & Associates taking part in Organization activities this week earn twice the pay for sticking by their employers"
Of course, if you're looking for real Black Friday game deals then we'll be bringing you the best of the best through the shopping season.